Want to be seen? Have something to sell? Want to do it online? 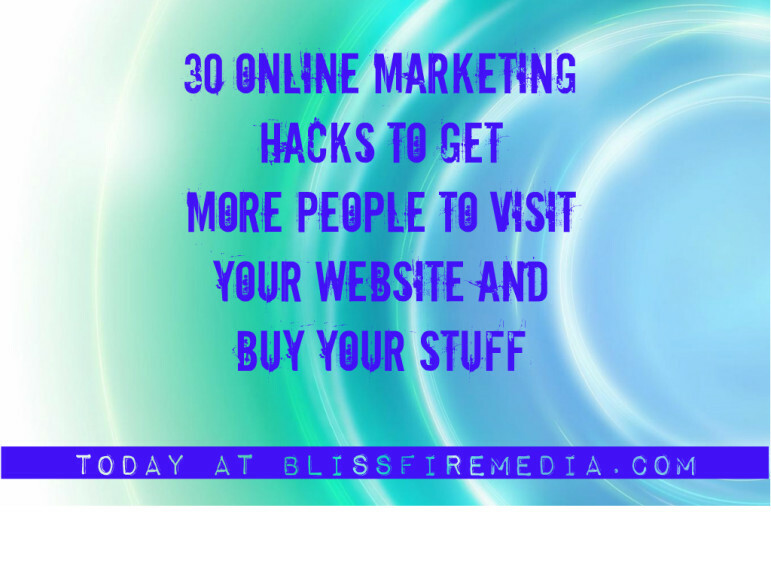 Try these tried and true ideas that will help you to take your online marketing efforts to the next level. Include the reprint/reproduction rights with your digital giveaway product (e-book, tipsheet, etc.) This increases the perceived value because people can start a business and make money. You can also include some of your advertisements in or on the product. The more it gets resold, the more your ad will be seen. Participate in chat rooms related to the product you’re reselling. Start a conversation with a person without trying to sell to him or her. Later on, while you are chatting, mention the product you’re reselling. You could end up selling your product, creating a friendship or finding a joint venture partner. Create a free e-book with the advertisement and link of your affiliate web site. The subject of the free e-book should draw your target audience to download it. Also submit it to some e-book directories. The more exposure your free e-book gets, the more your ad will be seen. Start your own affiliate program directory. Join a large number of affiliate programs and list them all in a directory format on your web site. Then just advertise your free affiliate program directory. You will earn commissions and gain sub-affiliates. Plus, you could start an affiliate-related e-zine too. Write your own affiliate program ads. If all the other affiliates use the same ads that you do, it won’t give you an edge over your competition. Use a different ad to give yourself an unfair advantage over all the other affiliates. If you have sub-affiliates, tell them to do the same. Use a personal endorsement ad. Only use one if you’ve actually bought the product or service for the affiliate program. Tell people what kind of benefits and results you’ve received using the product. You need to purchase the product or service in order to write a honest endorsement. Advertise the product you’re reselling in your signature file. Use an attention-getting headline and a good reason for them to visit your affiliate site. Make sure your sig file doesn’t go over 5 lines. Also include your name, occupation, business name and e-mail address. Join a web ring. It should attract the same type of people who would be interested in buying the product you’re reselling. You could also trade links on your own with other related web sites. Also you could create an e-zine ring with other e-zine sites. Participate on web discussion boards. Post your comments, answer other people’s questions, and ask your own questions. Include your affiliate text link under each message you post. If they read your message and like it, they may click to see what else you have to offer them. Create a free e-zine. Use your e-zine to advertise the affiliate programs you’ve joined. Submit your e-zine to online e-zine directories and promote it on your web site. Trade e-zine ads with other publishers. Announce your e-zine to e-zine announce lists. Start a private web site. Use it as a free bonus if people buy the product you resell. You could also allow people to join for free and you could advertise the affiliate program you’ve joined. You could also charge a subscription fee for an upgraded version of it. Provide your web site visitors with content they can’t read anywhere else. People will stay longer at your web site to read the original content. You could also allow them to read through your e-zine and archive the back issues on your web site. Or you could charge access to the back issues because it would be original content. Remind your web site visitors they can print out your content. They may browse around your online store while it’s printing. They may read it at home, work, outside, etc. Other people might see what they’re reading and want to visit your web site or subscribe to your e-zine. Offer your web site visitors a freebie if they take the time to fill out your online survey. They’ll be at the site longer and might buy something afterwards. Your survey could ask them what kind of products they want, what they think of your customer service, how they like your web site, etc. Offer your visitors free software that they can download right from your web site. While they are waiting they might read your ad. Also, if possible, include your ad in the software so after they open it, they’ll see your ad again. This will help increase your sales. Provide a huge online directory of information that your visitors could search through. The directory must contain information your visitors would want. It could be news stories, how-to articles, interviews, case studies, profiles, survey results, online audio, online video, e-books, reports, etc. Make sure all your web pages load fast or your visitors will get bored and leave. Time is precious; they won’t waste it waiting for your site to load. Do not use too many graphics and high tech gizmos. They may have a hard time finding your product ad. Tell your visitors what’s offered at your web site at the very beginning. If people are confused about what’s being offered they may leave too early. You could tell them the benefits they get and the things they can do at your web site, like subscribe to your e-zine, read free articles, download free e-books, learn to increase their sales, etc. Make your web site look professional. People will get turned off and leave if they see a lot of spelling and grammatical mistakes. You don’t want any broken graphics or links either. Make sure your background colors don’t make your text hard to read. You could hold a holiday sale for your potential customers. For example, you could tell them everything on your site is discounted by up to 50% on Thanksgiving Day. Another example, “Fourth Of July Sale! Buy One, Get One Half Off!” Using holiday sales gives you a specific and credible reason for your prices to be lower. Use headlines and sub-headlines all over your web site that will grab your visitors’ attention. They will attract them to explore your web site longer. They could be for your free e-zine, product ads, free content, message board, chat room, etc. Place colorful graphs, pie charts and other charts in your ad copy. Use charts as they will grab a person’s eye because they are usually colorful. They will also support your product or service claims and allow your target audience to understand them easier. Highlight buying incentives like free bonuses, money-back guarantees, testimonials, special offers, discount sales, etc. You could place them in boxes, in front of different colored backgrounds, assemble symbols or graphics around them, etc. Use short sentences or sentence fragments in the body of your ad copy. A short burst of words can catch a skimmer’s eye with one quick glance. If people have to read a long sentence or paragraph in order to understand your message, the skimmers may not order from you. Highlight all the important keywords and phrases in your ad copy. You could use bolding, underlining, different colors, graphic text, italics, symbols, indents and extra spaces to highlight the important words or phrases. Place attention-grabbing pictures above and within your ad copy. A powerful technique is to use ‘before’ and ‘after’ pictures of people using your product. They will give your target audience a clearer vision of what you’re offering. That will help them imagine themselves getting the benefits of your product. Use a headline that catches the attention of your target audience. You could use many different types of headlines, free offers, guarantees, testimonials, news stories, questions, benefits, warnings, statistics, features. Make your ad’s keywords and phrases stand out by enlarging the text. This technique works wonders with headlines and sub-headlines. People see them first because it’s easier for their eyes to focus on. You could also use different fonts for your headlines than the rest of your ad copy. Make your product’s list of benefits and features stand out by using a symbol in front of each of them. The symbol could be a dash, solid circle, star, etc. Also indenting them will help make them stand out. Each benefit should be written like a headline to get the readers’ attention and tell them what’s in it for them. Ready? Get started on your marketing efforts – but before you leave, tell me in the comments below which of these ideas you’re going to try first. Are you a DIYer? Get more useful information for online marketers, writers and entrepreneurs at OnlineWritingPro.com. Looking for someone to do all this stuff for you? Contact us or take a look at our services – we can help you out!